Check out arts & crafts with kits from the library! Tell me if this sounds familiar: I really want to try this new craft, but I don’t want to go out and buy all the tools and materials when I don’t know if I’ll really enjoy it. Great news! 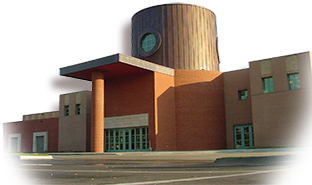 The library has Arts & Crafts kits that you can check out – so you can try it out before spending time and $$ gathering supplies and tools. Spool-knitting kit includes instructions, yarn, spool, beads, and other tools. Another thing always hangs me up when I explore new crafts is that I’m never sure how many tools and supplies I really need. If I’m learning my new craft from a pamphlet or website, chances are that it is provided by a company that wants to sell me lots of tools and supplies. Trying it out first helps me to make better decisions when I do decide to buy my own tools and supplies. Embroidery Kit contains a stitch guide, embroidery hoops, needles, fabric, and embroidery floss. 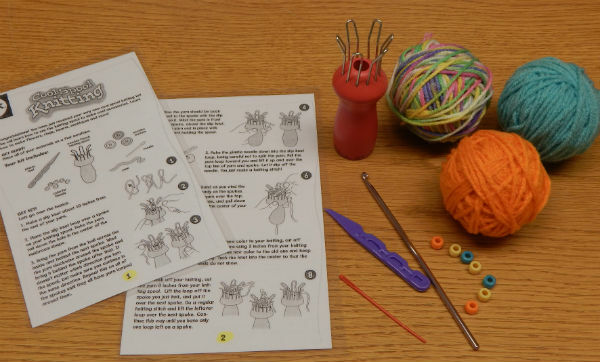 More great news: Arts & Crafts kits can be reserved just like books and movies! This is especially a good idea because these kits have been very popular! The easiest way to find them in the library’s catalog is to search using the term, Arts & Crafts Kit, to see all the kits that are available. 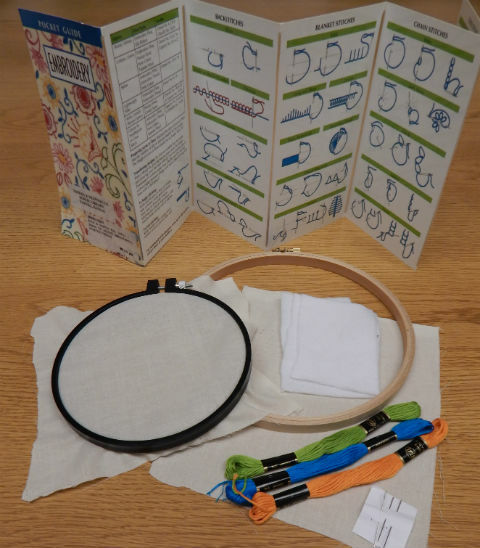 Kits contain instructions, books, and tools (such as knitting needles, embroidery, hoops, rubber stamps, etc.) that need to be returned with the kit. 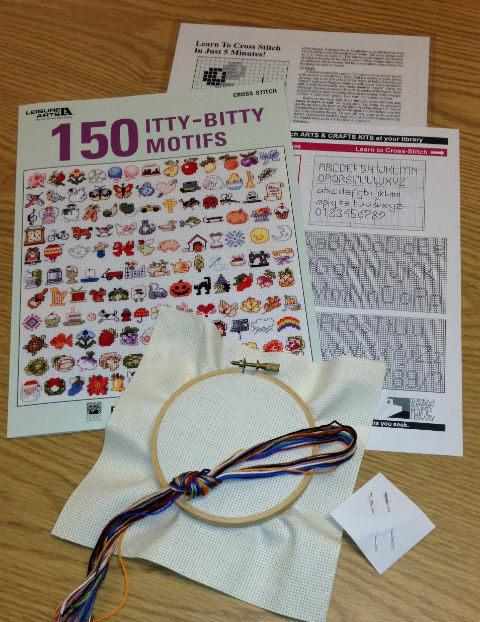 Kits also contain items such as yarn, embroidery floss, and paper that library customers can use for their crafts, and these “consumable” items do not need to be returned. Each kit lists which items must be returned and which items the customer may keep. 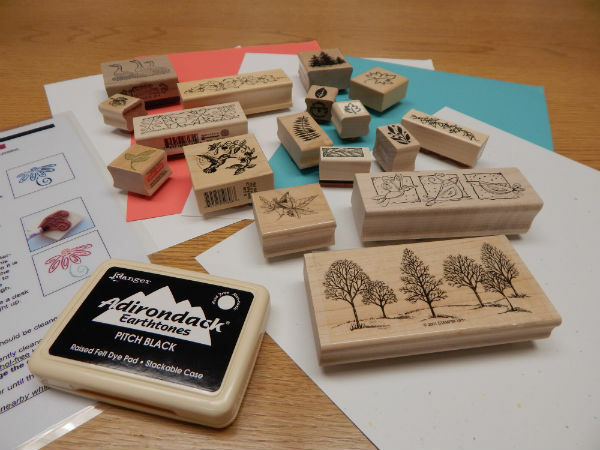 Rubber Stamp kit includes instructions, rubber stamps, stamp pad, and card stock paper. So you can check out a kit and make all of your own holiday cards and gift tags…or decorate your scrapbook pages…or any other wonderful ideas that you dream up! 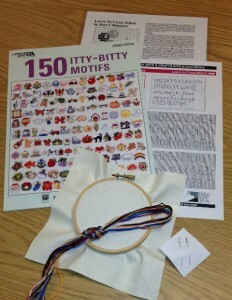 Cross Stitch kit contains instructions, cross stitch designs, embroidery hoop, embroidery floss, and needles. And the Cross Stitch kits contain enough materials that you can make a couple of small items, such as bookmarks or holiday ornaments. Now that you are armed with the tools and supplies, there are no excuses! Get out there and get crafty! 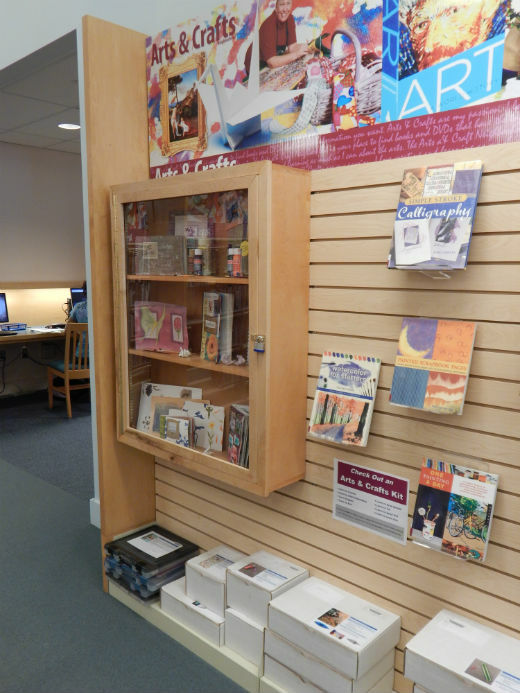 Arts & Crafts kits can be found in the Arts & Crafts Neighborhood in the library. Jill Mickel is a Public Services Specialist and a member of the Arts and Crafts team. Her passions are art and community, and she believes that art is for everyone! When she is not at the library or working in her studio, she can be found gardening, cooking, reading, or bird-watching. Posted in Around the Home, Art and tagged art, crafts, DIY.